Before I write a post about the best toys that I have found for the 18-24 months old crowd, I wanted to do a spotlight on my new favorite toy company with the kind of toys that last a lifetime and create many opportunities for learning and development. Tag Toys can be bought on TAGTOYS.COM or on AMAZON. I learned about Tag Toys in the usual way I discover companies. I had an idea for a toy that Lexi would really enjoy in my head and I set off to try and find that toy online. This time it was some kind of board with different switches and locks. It didn’t take me long to find Melissa and Doug products, however being very leery of big toy companies when it comes to quality (on that later) and knowing that many M&D, and other wooden toys for that matter, tested positive for lead and arsenic and a lot of other nasty stuff, I was set on finding an alternative that is safer. That’s how I found Tag Toys. The company was started with a goal to train intellectual deficits among children with learning disabilities. The founder of Tag Toys earned two separate Masters degrees in Psychotherapy and Educational Psychology as well as a Ph.D. in Educational Psychology. So the point of every single toy you see on their website is EDUCATION, DEVELOPMENT, HELP. SENSORY- MOTOR, the combined coordination of muscular activity and sensory modalities. But aside from the educational standpoint, these are really fun toys. One look at some of them will make you want to have one in your house and most likely the adults will be playing with them too. Their appeal is universal- everyone likes “tinkering” with things, watching the results, discovering possibilities and that is what Tag Toys so successfully managed to provide to the toy market. The issue with most big toy manufacturers that set up shop in China, or any other country other than the US, is that the testing for lead, PVC and other substances takes place in those countries, as well, often at their in-house testing facility. What that means is that corners get cut, profit and production become the keyword, and little kids don’t get taken into consideration. So while on the surface there might be nothing wrong with a cheaper toy, the truth is different batches can test positively for lead, barium, cadmium, PVC (as found out by Healthystuff.org) and that goes straight onto the hands and then mouths of our little ones. Tag Toys products get send to a third party to get tested for choking hazards as well as substances. While we can’t control any of these processes, it gives me better peace of mind to know that profit and production has nothing to do with how much junk there is in the toys, because the company has no control over the testing process either. The result of truly caring about your products and not going for biggest profit and cheapest toy is QUALITY. If one were to lay two wooden boards, one from Tag Toys and one from another manufacturer side by side, the difference will be obvious. 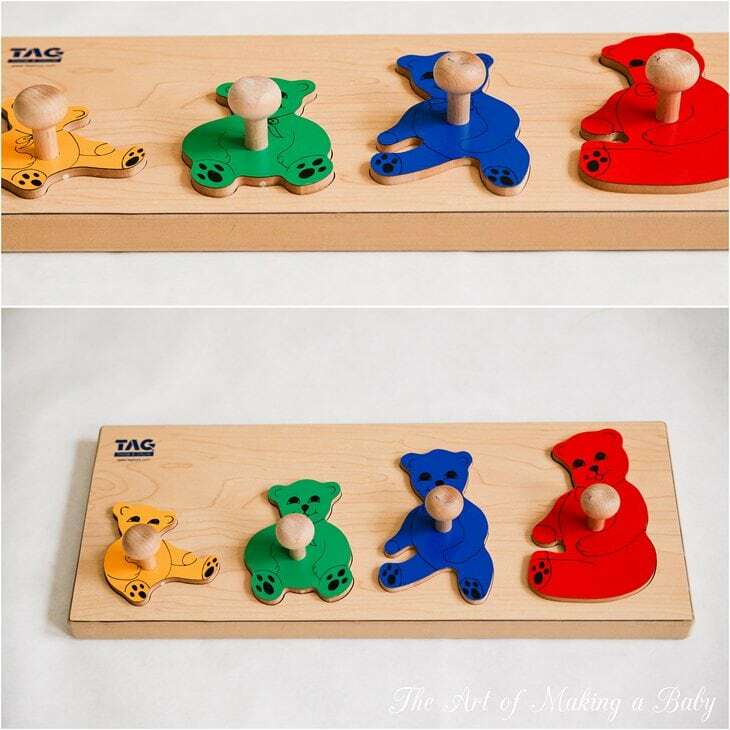 Tag toys are made of solid wood: thick, heavy, strong, clean and non-toxic. The quality is apparent. In fact, from the personal standpoint, Tag Toys are the highest quality toys we have in our house and we have A LOT OF TOYS from a lot of different companies. When on the phone with the company, one of the representatives told me a funny story. Apparently a lot of their products are meant for day care/school situations. Schools often try to save money which is understandable. So they go for the seemingly cheaper M&D products only to return back to Tag Toys a month or two later when those products have all fell apart. Tag Toys last! This might not matter to a family with one kid, but when you are planning on having more kids, Tag toys will definitely last throughout that time and be passed down generations, the kind of toys that never go out of style. A free standing , large, relatively expensive, well made, sturdy board that is a dream come true for a kid (and some adults). 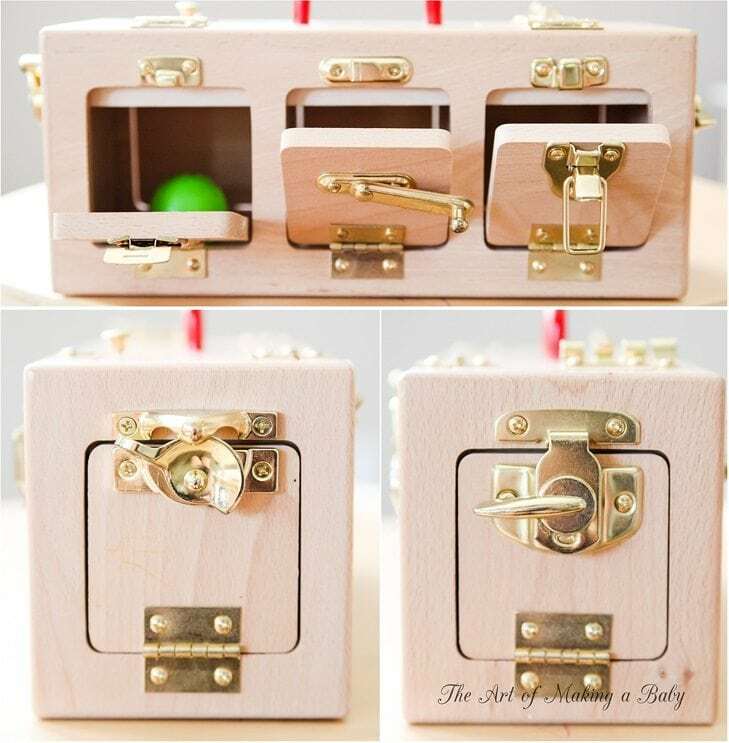 It features various locks, latches, switches and knobs for different skill levels and ages. The recommended age is 36 months plus, only due to the (unlikely) possibility that one of the items could get detached (a key, a lock) and choked on. Since I do not believe in leaving small children to play completely unattended (they can literally choke on anything if left alone), this toy is PERFECT for 12 months+ WITH parental supervision. I am personally in love with this board. 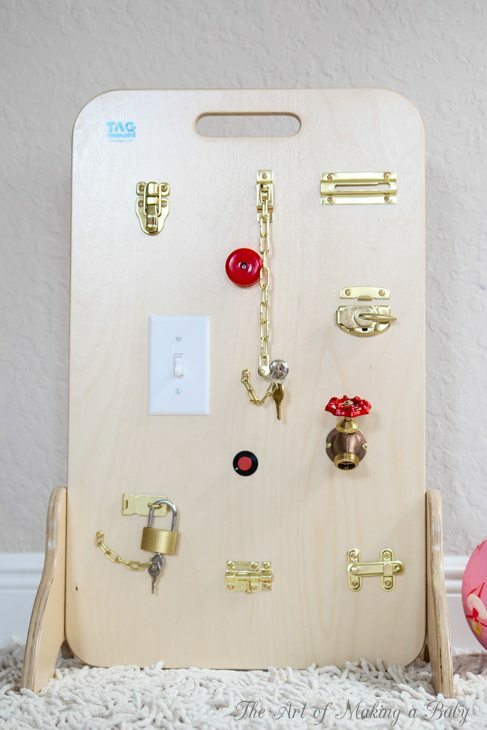 The variety of locks and latches are perfect for an 18 months old to tinker with and still leaves some room for skill improvement as she grows and becomes more dexterous. The quality is the same you see on all Tag toys: thick solid wood with a clear glossy finish. When we have kids over that are slightly older than Lexi, they automatically gravitate towards the board and stay there for a while playing with the locks. After the initial obsession with the new toy, when she’d spend periods of time playing with the locks, she now regularly walks over to the board to test her skills. While half the locks on it are still a bit challenging for her, it has amazing potential for growth as I always try to get toys that are slightly above her age to challenge her and grow with the toys. Once you show her one lock or activity, she would spend a long time attempting to repeat it, given that it is not too far beyond her skill level. And that’s what is great about the Tag Toys board: there are latches and locks that a dexterous 12 months old can play with, and those that 3 year olds would be interested in. I know it looks like it’s the kind of board that you might be able to make yourself, however the issue with homemade board like that is levels of toxins in these locks and items bought from a store. Would you be able to test to make sure that they are free of lead, as many brass items have lead added in it to make it more pliable? This is smaller more compact version of the Latches Board with the addition of the memory aspect. 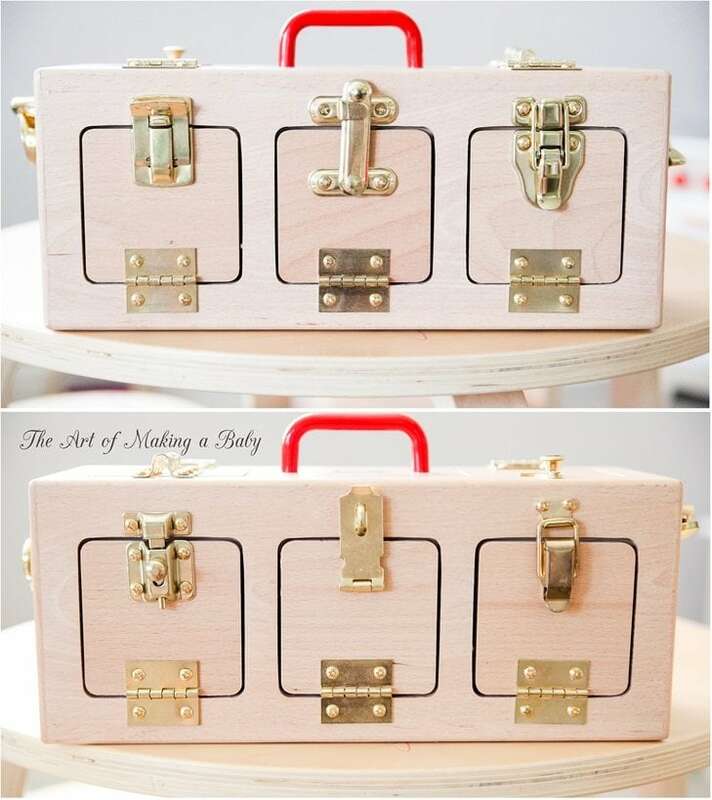 The Lockbox is pretty heavy, as it’s made of thick solid wood, but it’s portable enough that you can take it with you to go over to grandma’s or travelling. It has 3 separate compartments, 10 doors and 10 latches, behind which different objects can be hidden and re-discovered. As with the Latch board, this is a great toy for 12 months + with parental supervision. Since this is very similar to the board, our experience with it has been very comparable. We make sure we have ours when we stay at hotels, so that she has something small and fun to play with. She often carries it around, or brings it to me to play with. At this age, the hiding game has to be done with the help of a grown up, so we play around hiding different balls in there and try to find them using other doors. There is also a smaller version of the Lockbox that has 6 doors and two compartments. This is a simpler puzzle memory game, yet there is nothing simple about. Again solid solid SOLID wood- thick and strong- it’s incredibly impressive especially since we are all used to cheaper plastic toys or plywood toys. The puzzle is also a memory game and a size sorter. Large knobs are easy to pick up and the inside compartment under each bear is large enough to hide a crayon or a small ball or toy. Once you hide the toy, you ask your child to find it testing their memory or playing a surprise game. grasping with the hand and making simple puzzle fittings. recognizing and learning the names of common objects. memory skills for objects in sequence (important readiness skill for reading and spelling). This game can be played with even a small baby as soon as they develop object permanence, or even before that, as a surprise game. Like other Tag Toy toys, it grows with a child becoming more and more challenging as you develop new ways of playing it. This toy is a permanent fixture on our coffee table. Every day Lexi walks up to it, and picks up the bears one by one and then tries to fit them back in. Fitting the bears is slightly more challenging for her right now, because she doesn’t have the patience, but that’s a skill she will develop and that is precisely how this toy will continue being interesting. We usually hide small wooden animals in the compartments and then she proceeds to open every single compartment where she KNOWS the animal is not, until finally nothing is left but the correct bear. We can do this over and over again, up to 10 times in a row without her getting bored of it. There are so many Tag Toys that I would love to own and hope to purchase in the future. Every single one is meant to be fun and developmentally educational in more ways than one. Tag Toys sent the three featured toys for review. All opinions are our own. Neat! I think you mean Montessori? Lol of course I mean Montessori. Just so you know, lead test kits are widely available at hardware stores. It is like $6 for a bunch of lead testers. They are easy to use. Anyhow, if you were worried about lead being in a specific thing, it is a simple and cheap way to put your mind at ease. I am not saying that you need to go build your own latch board, that looks like a really nice one. Just that this is an option if you are worried about a particular toy or household object. Allowing very young toddlers to play unattended and figure things out by themselves is a cornerstone of Montressori teaching. The idea is to cultivate independence and exploration very early. Adults are reasonably nearby and available as a resource, but not solving problems for the child. It’s a really interesting philosophy, I’ve enjoyed learning about it. And I’ve seen how much my son can do on his own if I just get out of the way! It’s really amazing, watching their cognitive development at this age. Yeah I’ve actually used those lead kits but it’d be impossible to test every detail. But it is a good option in a pinch. As far unattended, there’s a difference between letting a child explore on their own and leaving them unattended. And I’m sure Montessori concept calls for the first. These toys specifically are really good for independent play focused on exploration. I love it! I can’t speak for Elena, but for me, I think you took it too extreme. I never let my son play in a room alone until he was over 3. Even then, it’s only for a few minutes here and there. BUT! That doesn’t mean I stand over him and tell him how to play all day. There’s a huge difference in helicoptering and being attached. It just means that I’m there for him if he needs to nurse, show off his work, ask a question, or stop him from seriously hurting himself. I’m guessing Elena is the same way. I do my work and housework near where he is playing. It’s to see him at all times and prevent him from doing something harmful (like jumping off of a table or throwing a toy at the window, etc). Yes, that is why I said, “Adults are reasonably nearby and available as a resource, but not solving problems for the child.” I don’t know how that is extreme. Allowing very young toddlers to play unattended sounded like the opposite to me! I have one question, you are very pro-non-toxins and eco friendly products but what is your stance on the gold course you guys live on and frequent quite often for play and photo ops? I’m just curious as to what your precautions are as far as that goes? Oh my goodness, that video of Lexi is TOO CUTE! The look of wonder in her eyes as she explores all the different latches, locks, etc is so lovely. Beautifully made video as well. You mentioned that the toys were made for children with learning disabilities. I wondered, is Lexi delayed? The only reason I ask is that I have a friend with a son Lexi’s age who is also not speaking, and the friend has been looking for resources/toys/speech therapy to help with that – thought you’d be a great resource! Would love to hear your experiences or recommendations! It’s just many of their toys work really well in honing those fine motor skills in disabled children. I’m not sure where several people have gotten the idea that she is speech delayed? People who I never saw would ask me on fb about my son’s speech when he was younger. I think it was the lack of videos showing off his speech? No offense to anyone, but I have never liked the talking 1 year old videos. The only people who usually like them are the family. Haha! 1 year olds are hard to understand and can be shy with the video on. Even my 3-year old will ham it up for photos and shut down when I’m recording him! He doesn’t talk nearly as much around friends we rarely see as opposed to every day people. OMG lately I can’t videotape ANY cute thing she does/say. It’s like she knows and stops even though she doesn’t necessarily acknowledge the camera. I have a long running list of things I want to record on camera but I keep failing. Don’t worry! No offense taken! 🙂 most of the videos posted are from months ago. I shoot all the stuff long before I find time to get the post out. Fantastic toys! Thanks for introducing me to a new company. So, I got a bit lost in the details? Are these toys completely lead free, non-toxic, etc? 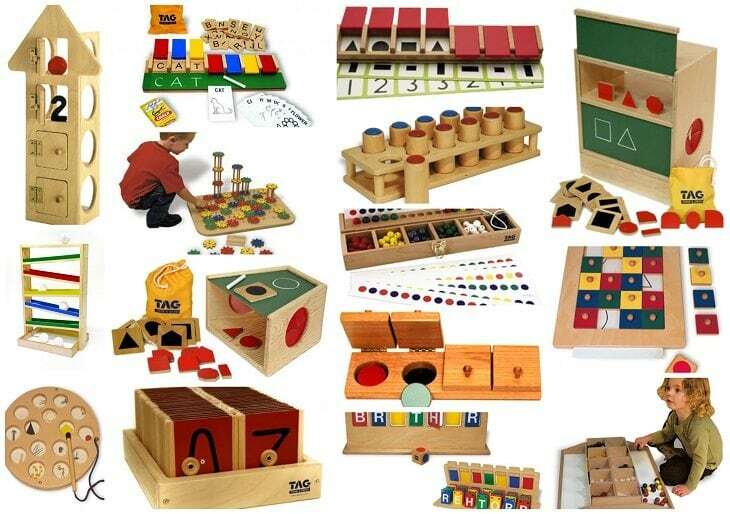 The Montessori approach is my favorite method of teaching for children. Have you considered Montessori for your daughter? They are complaint with all the standards including the new lead standard of 90ppm. They sent me their testing results a while ago(I tried to find it in my email but couldn’t right away), and I remember the results were exceptional. So when most companies say non-toxic, they usually mean complaint with requirements, not actually completely free of lead. I’ll try to find the actual numbers in my email if I can, but somehow I remember 10ppm being the number for lead and 5ppm for arsenic/barium. Interesting toys! As usual, thank you for introducing another alternative for educational toys, these posts are always a fun read. 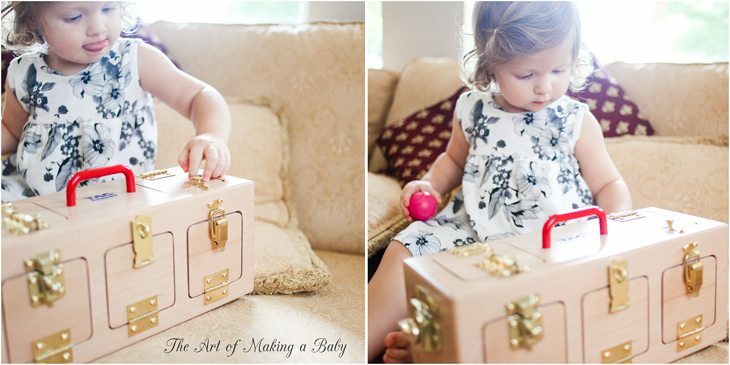 I especially liked the lock box – seems like a toy my little girl would love. 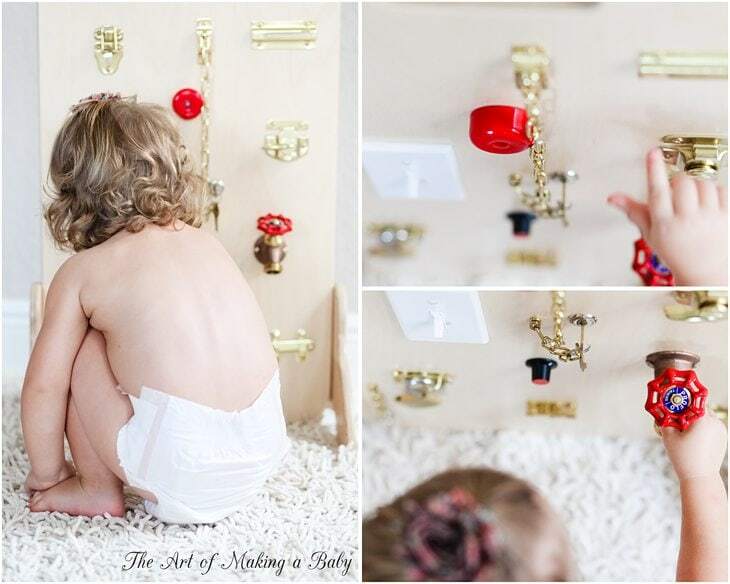 I am curious to know if kids will get bored with all those latches, etc. once they master the locks? Kids move on from toys like this very fast, and these are a big investment… I have a bunch of puzzles that my daughter never picks up any more, and she probably played with them for less than a week each. Due to the price and size, these may be more appropriate for schools/day care situations, where they can get a lot of mileage out of one toy…which is why the company seems to cater more to schools. Yes you’re absolutely right. But it just makes me feel better to know that a third party does the tests. Because corners do get cut when they can be. But if it’s out of control, for profit or not, you can’t really influence the testing. As far as longevity of the toys, one thing I have to say about the lockbox and board is that the locks have varying difficulties so as they grow they are able to open and master more and more locks. 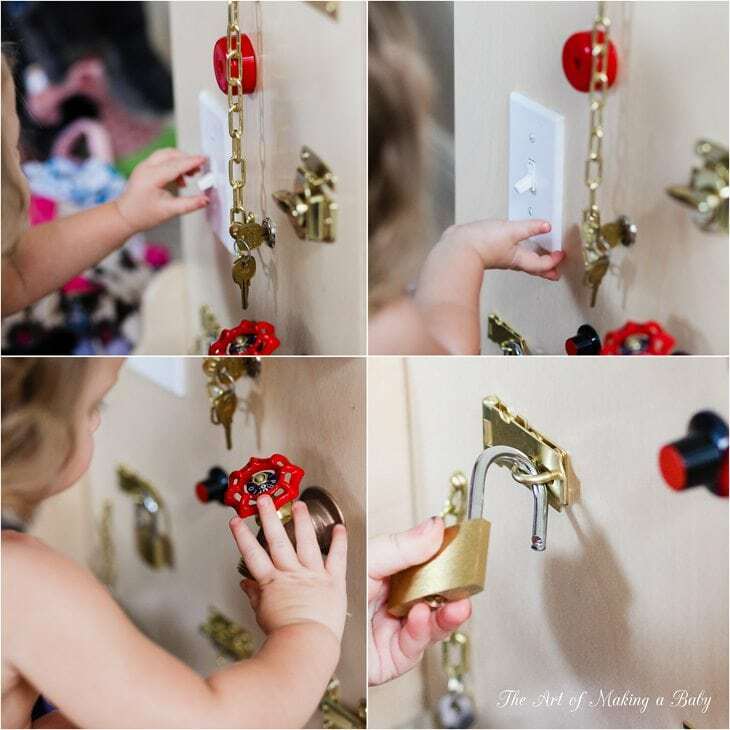 Like the lock and key on the board isn’t smth a 2 year old can do but much older children will love practicing with it. Good God, you are up late! Lockbox is going on the X-mas with list, I do like it and kids do love putting stuff in boxes. You totally must have another baby, otherwise all those toys are going to go to waste in a couple of years! LOL – it is all about the return on the investment. This is just for the sake of the discussion, and not to make you feel bad, but sure you can influence the third party – they work for you, you pay them – testing is a service provided for a fee. Testing facility wants your business, they also have time/resource constraints of their own. I am a little jaded, of course, and I do not know TAG’s specific arrangement, but it is best to be a realistic consumer. That video of Lexi playing is adorable and I especially love the lock box. She could continue to have great fun with it as she grows too, using it in combination with other toys and eventually to store special items. What is the song in the video? I always have trouble finding good quality royalty free music to put to videos. Love these toys! Silas is 3.5, but I know he would love all those locks. I also love that you write about not leaving little ones alone to play. It’s so dangerous! You just never know what they will find/do! I hope you don’t take this the wrong way, and this is more a question for all bloggers, not just singling you out– but it’s getting harder and harder to sort through authentic reviews of products/toys with staying power these days with all of these “sponsored” posts. To me, getting paid for an endorsement, or getting sent a product to test is the same thing, and I can’t find myself trusting a review of something like that. I appreciate your research of certain companies and products, but for instance on this post there are over 30 clickable links that you get paid for. Again, I understand that you run a blog as a business and this is a way to keep it up- for that I applaud you. I guess I am just over saturated with bloggers suggesting toys that they are eating paid to review. Sorry to keep that long. Products aside, I like your blog because I myself am a sorta-AP mom, who trys to be “green” and I like seeking out other moms and see how they live their day to day life. My daughter is a few months younger than your beautiful Lexi, and its fun to see the similarities. I for one would love to see more food posts. Always looking for more ideas. I totally understand where you’re coming from, Jessi! I don’t have time to read blogs anymore, so I am not sure if everyone does it that way or thinks the same way as I do, but I take pride in my work and anything I write here, and I would never write something that I am not myself excited about. Neither do I accept products that I know with a high certainty would be a hit or write paid reviews of products. So while I understand that some bloggers might write post for the sake of getting products for review, I write posts because it’s something I love. But like I said, I totally understand what you’re saying and it’s your prerogative as a blog reader to believe or not believe the reviews. This is crazy but awesome idea! It is a great DIY project too. 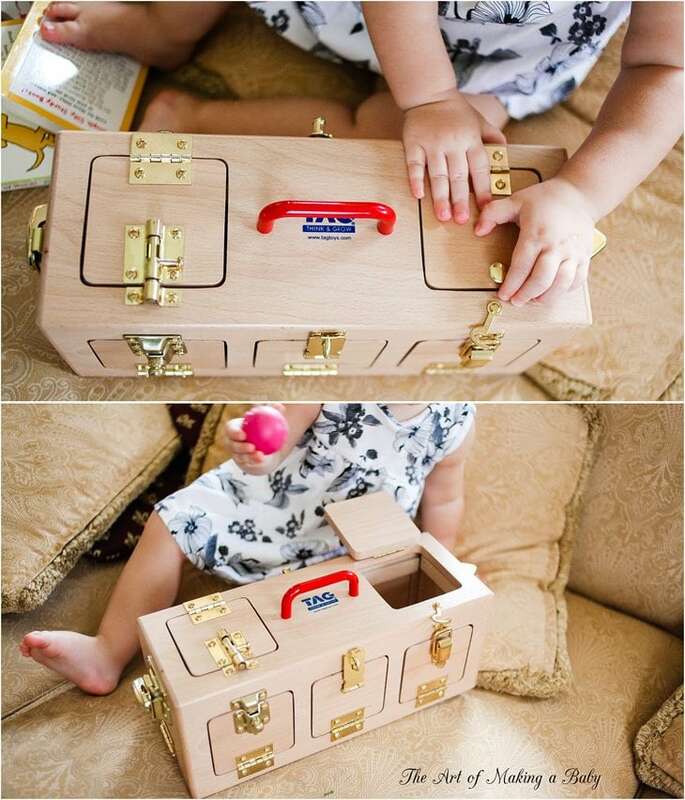 I am thinking of purchasing Tag Toys Noah’s Ark or memory lock box. Do you happen to own the ark? How has the lock box held up? Thank you!